SharePoint Solutions to Distribute WISDOM SharePoint Document Management Software in U.S.
Summary: SharePoint Solutions has forged a partnership with Australia-based MacroView Business Technology to serve as a U.S. distributor and integrator of MacroView's WISDOM line of products. Organizations throughout the world use WISDOM to extend and enhance SharePoint document management capabilities. Nashville, Tenn.-based SharePoint Solutions has forged a partnership with Australia-based MacroView Business Technology to serve as a U.S. distributor and integrator of MacroView's WISDOM line of products, which extend and enhance Microsoft® SharePoint document management capabilities. While SharePoint has filled a critical gap in the area of affordable document management, there are significant capabilities missing from SharePoint 2007's document management system that growing organizations need, and that those using high-end proprietary systems don't want to give up in their quest to lower costs. "Native SharePoint simply isn't full-featured enough for organizations with thousands to millions of documents in diverse locations that need to be navigated and managed. As a result, these types of customers have had no choice but to continue to use two separate systems-SharePoint and another expensive, proprietary document management system-to meet both document management and collaboration needs," said Jeff Cate, president of SharePoint Solutions. 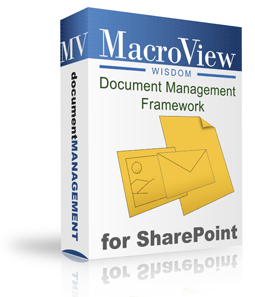 Since 2006, MacroView Business Technology has been working on a professionally developed and supported, 100% native add-in named WISDOM Document Management Framework (DMF) to fill this gap in SharePoint. "WISDOM DMF enhances SharePoint to be on par with the leading non-SharePoint document management systems in the world. It also streamlines the workplace experience by eliminating the confusion of going one place for documents and another for collaboration. Office work becomes less complicated and IT has less to manage," Cate said. WISDOM DMF provides tree view navigation of all sites, document libraries, folders and documents in one or more server farms. It supports drag and drop to move files between document libraries and preserves all metadata and version history. According to Cate, a WISDOM solution is usually about half the price or less than a comparable Documentum, Interwoven, Open Text, Oracle or IBM solution. All of the functionality of WISDOM DMF is available throughout the Microsoft Office client applications that are used most frequently in document-related tasks: Microsoft Word, Excel, PowerPoint, Outlook and the Windows desktop. WISDOM DMF also provides an installable WISDOM Explorer client application for Windows XP and Vista computers, enabling greater productivity with common SharePoint document management tasks, such as moving documents from one library to another, than is found in the out-of-the-box SharePoint web page interface. In Microsoft Outlook, WISDOM Message enhances the integration of Outlook and SharePoint so that saving and managing Outlook messages in SharePoint is both easy and effective. It gives Outlook users the capability to drag and drop e-mail messages into SharePoint document libraries, using the same tree view navigation as in their SharePoint sites. "There is no better product available that enables Outlook to communicate properly with SharePoint than WISDOM Message," said Michael Auschrat, IT/CAD manager at Cohos Evamy in Canada. Based in Nashville, Tenn., SharePoint Solutions is a national leader in Microsoft® SharePoint products and technologies training, consulting and add-on software. The company's software division professionally develops high-quality commercial add-ons for SharePoint, including the award-winning Extranet Collaboration Manager for SharePoint 2007. For more information about SharePoint Solutions, visit http://sharepointsolutions.com.